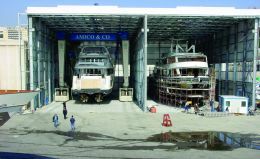 Amico & Co is a leading company in Italy and among the first in the world in the sector of repairing and renovating megayachts, established by the entrepreneurial initiative of the Amico family, also owner of the Luigi Amico, well known company in the Genoese naval sector. Amico & Co. began operation in 1991, distinguishing itself for its high quality of service. This has translated into economic results, which are constantly on the rise, thanks also to a heavy investment program, begun in the mid 90's, culminating in a strong boost in 2002-2003. 80% of the company's clients are abroad, with over 110 clients served annually and there are more than 30 units available contemporarily to accommodate the crafts. The company has a flexible workforce, between 60 and 120 employees, in addition to the use of external specialised companies. The shipyard activities concern all types of repair and renovation of megayachts ranging from 20 to 100 metres, with structural, mechanical and equipment work, especially with regard to the external finishing of painting, equipping the "customised" interiors, woodwork and plating to the workmanship on period style hulls. Amico & Co. can boast the skill and management of shipyards with many years of experience in the sector, with particular reference to the "masters of the rough and ready", thanks to whom it is possible to renovate period hulls in wood. The project for growth in the area of ex naval repairs in the port of Genoa has been articulated with the progressive expansion of the shipyard. The new structures realised in recent years include: a travel lift of 510 tonnes (the largest in the Mediterranean), two covered renovating areas fitted with conditioning systems for the area and handling of the painting oversprays, 2,000 m2 of new artisan laboratories and workshops. These have allowed the shipyard to extend its ability to act as a covered boathouse for crafts of up to 55 metres, with lower costs with respect to the traditional dry dock. The latter is available, in any case, and equipped with ad hoc coverage for boats of over 55 metres. This allows a considerable saving on the costs of putting to dry and cover for large boats, as well as improving accessibility to boats for necessary work. 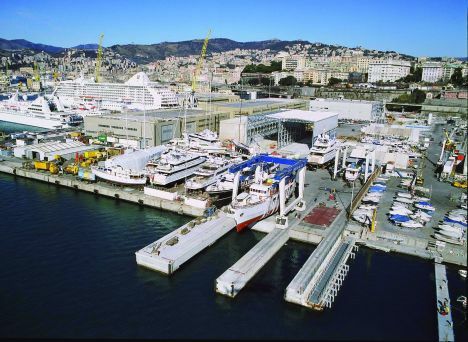 Completion of the second phase of investments is tied to the larger project of re-qualifying the areas to the east of Riparazioni Navali (headquarters of the shipyard) and includes the expansion of the Marina of the Genoa Fair with the relative work connected. Amico & Co. foresees the realisation of a new wharf at sea which will allow to work in adverse weather conditions and to avail of its own moorings to work on boats when floating. Investments have also been approved for an ulterior expansion of the ground structures, for an overall surface area of over 4,000 m2 between covered and uncovered. Today, the shipyard covers an area of approx. 30,000 m2, 9,000 m2 of which is covered. The haulage and launch areas include a 200 ton platform for gliding hulls, with a system of universal launching cradles, and a wharf with two travel - lifts: the first of 300 tons and the second 510 tons of weight. Amico & Co can use wharfs for mooring suited to hulls of up to 100 metres. The scene is completed by the possibility of using dry docks managed by Ente Bacini, S.p.A. where Amico &Co have designed and produced a mobile telescopic coverage of 70 m of length. This allows to carry out painting, conversion, equipping, and maintenance work in controlled environmental conditions on leisure boats of up to 70 m of length and more than 2,000 gross tonnage. The specialisation, which have distinguished the shipyard, are the workmanship in wood and painting, work on the interiors and mechanical and equipment work. For the woodwork the carpentry, whose personnel is specialised in the recoating of decks in teak, structure and plating repair, masts, interior equipping with lightened materials and use of prestigious essences. Furthermore, Amico & Co. carries out woodwork in steel and alloys for constructions and modifications to hulls, and anti- corrosive treatment of the underbody by dry sanding with guarantees of up to 3 years. The shipyard is also official Caterpillar "service" and carries out alignments and re-motorizations in addition to the mechanical, hydraulic and pneumatic equipment work. The philosophy of customer service is testified by the assistance which the shipyard is able to carry out also in the area of special insurance policies for boats at work, registration activities, customs clearance, export and import. For further information please contact: Amico & Co. S.r.l. - Calata Gadda - Via dei Pescatori 16128 Genoa - tel. 010 2470067.